This is a great asparagus risotto recipe if you really, really love asparagus. Most risotto recipes calling for asparagus just fold in the asparagus at the end. 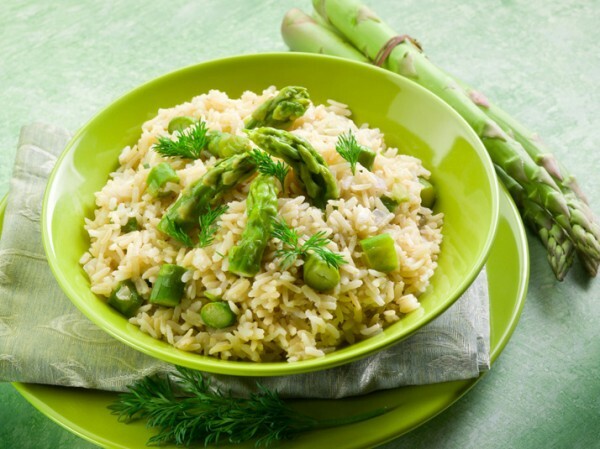 Here we infuse the stock with asparagus, and then finish the rice with a purée of asparagus to make this an over-the-top asparagus-lover’s dream! I hope asparagus shows up at market in time for me to request this for mother’s day! Snap woody stems off asparagus stems. Place these woody stems in the large stock pot and add Chicken or Vegetable stock. Bring to a boil. Blanch long asparagus stems in boiling stock for 2-3 minutes, or until they just turn bright green. Remove promptly and plunge into an ice bath to stop them from cooking. Drain, and slice off asparagus tips and reserve. Discard woody stems in stock, and return the stock to the lowest heat level and cover. Roughly chop asparagus stems and place in a blender with 1/2 cup stock. Purée and reserve. When the rice is almost fully cooked, stir in the puréed asparagus. Then gently fold in the asparagus tips until heated through. Remove risotto from heat and stir in butter, lemon juice and Parmesan cheese. Adjust seasoning, and serve immediately. Recipe adapted from Urban Italian, by Andrew Carmellini.